Drawing inspiration from the classic polo shirt that we have been making since the 1950s, this beautifully crafted jumper is a classic style that will lend sophistication to any outfit. Crafted from a luxurious merino wool that is exceptionally soft and lightweight, it features a 3-button fastening, ribbed hems and cuffs, and a crisp collar. 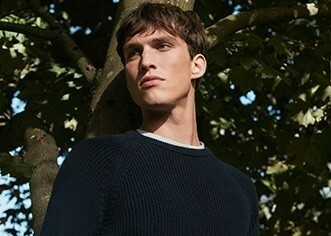 We make our polo jumper using a merino wool which is not only supremely soft, but strong and long-lasting. This is a lightweight knit which makes it an ideal layer year-round. Wear with a crisp t-shirt and chinos for a refined weekend look.